Latch plate only for Part Number KC6277, K-10 Clamp. Latch Plate, De-Sta-Co™ for KC6279 - K-10 clamp. Bale (with nut) fits the K-10 Clamp Set, Part Number KC6277, or KC6279. 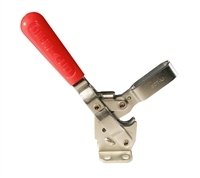 The K-10 Clamp Set has an adjustable threaded draw hook. Used for temporary mounts, short run, prototypes, and machined molds. Steel Striker plate for either size Almond flange clamp, KC6286, or KC6280 used to distribute the clamping force along the parting line. Adjustable threaded draw hook type clamp used for temporary mounts, short runs, prototypes and machined molds. Clamp only, no bale, no nut, no latch plate. These bolts with nuts and washers fit either size Almond Flange Clamp, KC6286, or KC6280. This "J" Bolt fits KC6283, Almond Frame Clamp, ALM-30. Comes with nuts and washer. Ideal for areas in which work is performed with holding capacities of up to 1,200 lbs. For example, assembling, drilling, testing, gluing and other processing operations. Suitable for use in welding fixtures and in checking fixtures. Torsion-protected, hardened bushings in models with a holding capacity greater than 35 lbs. 500 pound holding capacity. Ideal for all sectors in which work is performed with holding capacities of up to 1,200 lbs. Heaving-duty clamping bar is highly suitable for adaptation to fixtures where it can be individually cut in lengths at a specific angle. Applications: assembling, drilling, testing, gluing and other processing operations. Suitable for use in welding fixtures and gauge manufacturing, as well as in all sectors of the woodworking industry.